Everglades’ 230CC is the smallest of ten models of center consoles in its lineup for 2016 ranging in size from this maximum 300 horsepower 23-footer up to the maximum 1,400 horsepower flagship 435CC with up to four outboards on the back. This Edgewater, Florida builder also offers one dual console model, the 230DC; two pilot models, the 295 Pilot and the 325 Pilot (think center console with a fully enclosed helm); three cabin models, the 320EX, 350EX, and the 350LX, bringing the total model count to sixteen. Everglades also offers fully customizable boats through its Commercial and Government Division. With the 230CC, Everglades intended to create a “family-friendly, multi-purpose fishing boat” offering family cruising and watersports features as well as fishing amenities. As prime examples of the family cruising and watersports-friendly features, Everglades provides as standard equipment a waterski pylon mounted on the standard hardtop, a stainless steel split bow rail with a removable bow ladder to facilitate beach boarding, dual swim platforms with stainless grab rails plus a hide-away retractable boarding ladder, plus a portable 65-quart Yeti®cooler. Specifically for fishermen are the dozen rod holders, 60-gallon self-draining fishbox, and a 27-gallon circulating and lit livewell with clear acrylic lid molded into the stern ahead of the motor and between the two folding stern seats. These stern seats are further fishing-friendly as, when the seatbacks are folded and latched down, act as a pair of rear casting platforms. The entire raised bow U-shaped seating with standard filler cushion to create a family-friendly sunlounge, also serves as a bow casting platform. Beneath this raised bow seating area is a large storage hatch with a light. Another cushion supplied as standard equipment fits between the forward console double-wide bench seat and the bow seating to create a huge sunpad. This cushion has dedicated storage within the console head compartment which itself is equipped with a standard Porta-Potti. The helm of the 230CC is fitted with a double-wide folding bench seat with integrated footrest to allow sitting or standing. Everglades’ patented sliding adjustable windshield is mounted within the aluminum powder-coated hardtop frame. 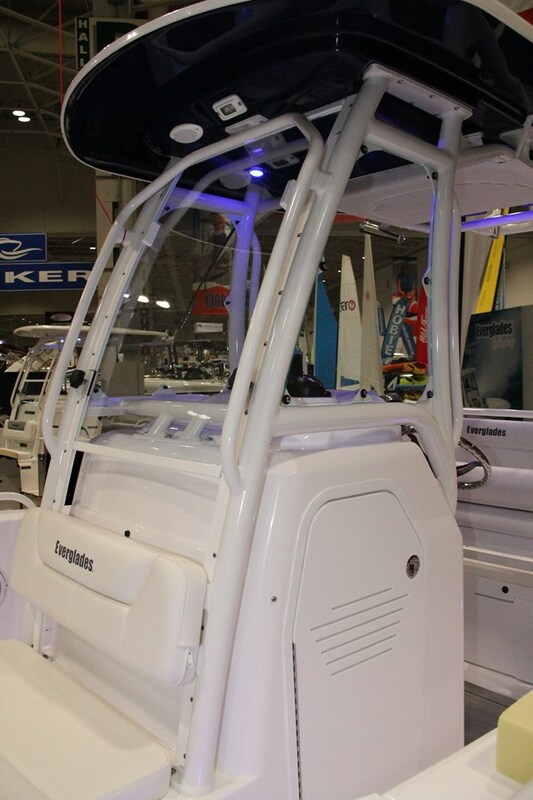 Within this hardtop are standard blue and white LED lights, spreader lights, an electronics box, four rod holders mounted on the hardtop’s trailing edge, a canvas lifejacket storage compartment, plus two speakers for the standard Bluetooth compatible Fusion stereo. The helm console features a standard tilt stainless steel wheel with hydraulic steering, storage bin/glove compartment, drink holders, hand rails, DC power port, two fire extinguishers, plus mounting space for up to a 12-inch navigation screen. The 230CC may be outfitted with your choice of a single Yamaha 250 or 300 with Yamaha’s Command Link® Plus display and standard stainless steel propeller. Everglade reports performance with the Yamaha 300 to provide optimum cruising speed of 27.2 mph at 3500 RPM providing a range of 282 miles. Top speed at 6250 RPM is 50 mph. Other notable standard equipment includes all composite construction including the transom, built-in rigging troughs, acrylic top coated vinyl upholstery with flow-through foam cushions, bow anchor locker with anchor roller, pull-up cleats, cockpit coaming bolsters, four stainless steel flush-mounted gunwale rod holders, under-gunwale power ports, bilge high water alarm, dual battery switch, raw water washdown, plus auto-retracting trim tabs with position indicator. Standard hull gelcoat colour is white but you can optionally choose between nine other colours not only for the hull sides but also for the hull bottom plus the underside of the hardtop. And if none of these colours appeal to you, you can also choose from an Awlgrip® paint colour chart. Other notable optional equipment includes twelve choices or combinations of Garmin electronics including chartplotters, sounders, radar, etc., Sirius satellite radio, Tracker Satellite security system, underwater camera, Premier audio upgrade package, various canvas cover options, bow area coaming bolsters, fresh water washdown, underwater lighting, plus an outrigger package, among others. “The Dougherty family has spent a lifetime designing, building, running, and enjoying unsinkable offshore boats” and all this experience has certainly seemed to have come to fruition in the 230CC.